Now this is truly a scrumptious treat of a book. I picked it off the shelf when we were having a long awaited summer heat-wave in July. It’s just the right sort of book for a lazy summer’s day. It’s not too deep, not too troubling and has whiffs of magic. I do like a bit of magic in my books sometimes. The story and it’s main characters are introduced by a bottle of wine – a Fleurie 1962, to be exact. I do like wine, but am not particularly knowledgeable when it comes to grape varieties. Luckily, this book isn’t all about wine, although there is something magical about the ‘Specials, 1975’. The ‘Specials’ are six dusty bottles in Jay Mackintosh’s basement. They contain a strong, home-brewed wine made by a long lost friend, and are filled with memories and magic. When, on a whim, Jay opens one of the six, he starts to feel nostalgic about his childhood summers spent in a small town in the north of England. There, he met Joe – the maker of the wine. Blackberry Wine is split between three summers of Jay’s youth and his present life as an unenthusiastic writer. For years he’s been writing unoriginal science fiction novels, leaving his typewriter – the thing he uses for proper writing – to gather dust. He wanders through life half-heartedly, with a bossy girlfriend he doesn’t love and a career that’s going nowhere. But all that is about to change. Escaping his dreary life, Jay runs away to France, leaving everything but his typewriter and the ‘Specials’ behind. Moving to France was always Joe’s dream, and somehow Jay has a feeling that it’s meant to be. In the small village of Lansquenet, Jay starts to write again. He also starts to live again, as he clears out the garden, using Joe’s old tricks to grow vegetables and fruit. Gradually he settles in to a new way of life and even becomes friends with the locals. The woman next door is more difficult to please. Mystery surrounds her, and Jay is sure that her secrets are the key to finishing his new book – but will that come at a price? As he tentatively breaks down the barriers between them, he realises that it’s more than her past and his book that’s attracting him. I loved elements of this story; the subtle hints of ‘magic’, the coming of age idea and the references to life in France. However, there were some major flaws. The build up was too long and at times boring, which I could oversee if it weren’t for the disappointment of the final chapters. The end was a hurried jumble of farcical situations followed by a dark ‘twist’. 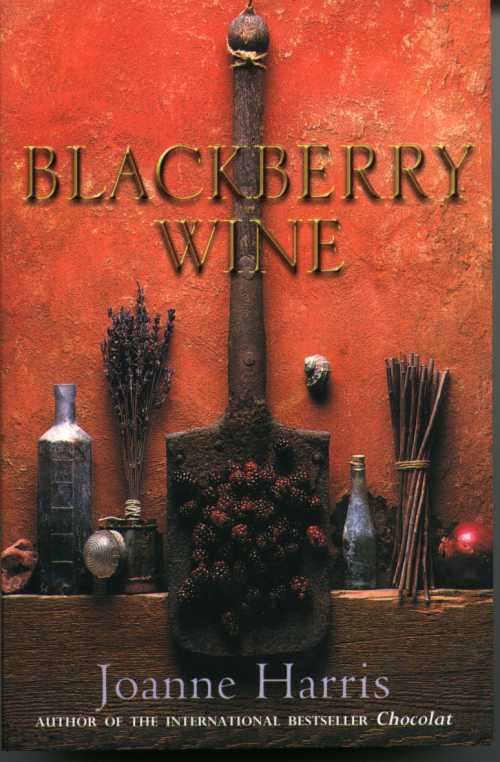 Blackberry Wine isn’t the sort of book that needs a shocking mystery, especially as it has a plot based so strongly on ‘everyday magic’. It’s a shame Joanne Harris couldn’t have taken this into account with her own book. Thanks for reminding me about this book…I read it years ago and, although like you said, it dips in bits, generally it is very good and contains that special blend of Joanne Harris ‘magic’. I have to be in a VERY specific mood to appreciate her books but, when that mood comes around again, I cannot wait to read ‘Peaches for Monsier le Curé’! Love the Chocolat books…. The Chocolat books? There are more than one? I think you are right about having to be in a specific mood to read this type of book. Reading them on a long sunny day when I couldn’t be bothered to do anything else seemed to work for me! I second the recommendation for Chocolat – I haven’t seen the film and never really fancied the book until I was stuck on holiday having run out of anything else to read (!!!). It is great, really magical! Thanks! I’ll definitely put it on my list! Well, I’m intrigued about the short stories now! Thanks 🙂 I loved the film Chocolat, so really must read the book if it’s better! I’ll probably still imagine Johnny Depp into it though! Yes! I find that too. But I’m hoping that in this case I will like them both!